or download it here, now! Rush Express 69 - 2014 Worldwide "A-Z Edition"
The Grand Liquidation Sale Continues - Everything Must Go! is available to download as Adobe Acrobat PDF files. All items are subject unsold. Click on the icon/s to download the PDF file/s. Corrections and Amendments are shown in italics below the page number. IMPORTANT NOTICE: RUSH EXPRESS NO. 69 – prices supersede all previous Worldwide Offers. Page 28 Falkland Islands 1974 Battle to France 1900 50c. Page 29 France 1900-06 2fr. to French Morocco Agencies 1943 1f50. Page 49 Maldive Islands 1973 Scouting MS to Manama 1972 Football imperf. Page 59 North Borneo 1956 75th Anniversary to Oman (Propaganda Issues) 1982 Scouts MS imperf. Page 73 Staffa (Scotland) 1981 Birds to 1982 Butterflies imperf. Page 81 Tristan da Cunha Gutter Pairs, Booklets, Airletters, etc. Page 88 Zimbabwe 1988 National Gallery to Postage Dues, St Vincent Cars, etc. Page 130 Omnibus Editions - 1982 Royal Baby, 1987 Queen's Ruby Wedding, etc. Page 135 Omnibus Editions - 1997/98 Princess Diana 'In Memoriam' Issues, etc. G.B. 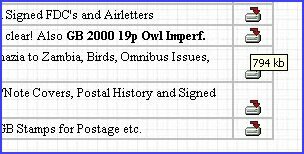 Mint Decimal stamps accepted at 60% face value (No Postage Dues) as payment or part payment against your order. simply let the mouse pointer hover over the download icon. Copyright © 1998-2016 [Rushstamps]. All rights reserved. Information in this document is subject to change without notice.